The reconstruction of the 469-year-old Alaca mosque located in Bosnia-Herzegovina’s southeastern town of Foca is nearly finished after five years. The historic mosque, constructed by Hasan Nezir, a colleague of the legendary Turkish architect Mimar Sinan, was demolished with explosives by Serbian soldiers during the Bosnian war between 1992-1995. The remaining stones from the demolished mosque were also disposed to prevent a future reconstruction at the time. Adnan Ertem, head of Turkey’s Directorate of Foundations, said the reconstruction of the mosque is expected to be finished by April or May. Ertem said the Turkish Directorate of Foundations took on the reconstruction project after a group of Bosnians found the disposed stones and contacted Turkish authorities for support. A team of experts analyzed the historic pieces and reopened an unused stone quarry near the mosque, which had stones that closely resembled the original ones. After the quarry was depleted, the team found a similar stone quarry in Mostar, a city located 150 kilometers away from the mosque, and transported the remaining stones to Foca. 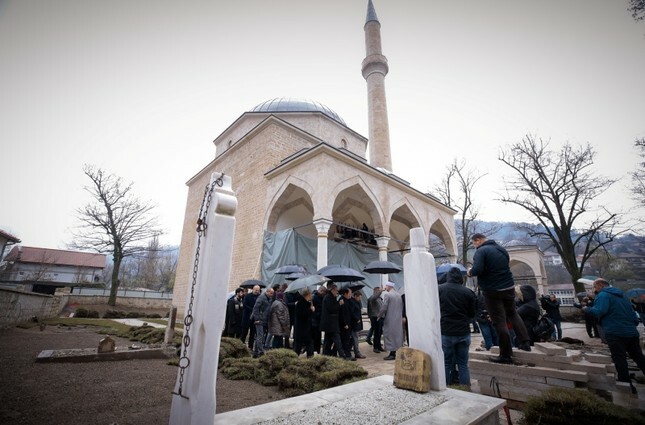 Once the reconstruction of the Alaca mosque is completed, the Directorate of Foundations will hand it over to Bosnia-Herzegovina’s Islamic Union.